Moscow, The race of getting more and more likes and followers on the social media has made the young generation the psychic patients. They look for more and more likes and likes on their social media accounts. 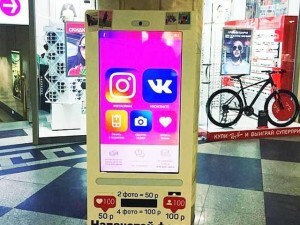 The young generation can get more and more likes and followers on the Instagram by paying some amount in the Russian shopping centers. This machine is installed in the popular shopping centers in six big cities of Russia like Moscow, Saint Petersberg, Saratough, Owafa, Cheborusky and Peterozosk. This machine is called the Instagram likes and followers machine. If you insert 60 Robles (88 Pak rupees) in it then you can get 100 likes on your picture but they will be fake. If you pay 100 Robles (180 Pak rupees), then you can get 100 fake followers on the instagram. 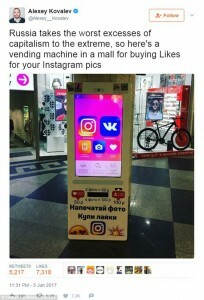 The Esnatap company has prepared this machine and this machine is called the Instagram like vending machine. A journalist in Russia protested on it and tweeted that the capitalism is on the peak with this machine in Russia. If you think that these likes are less, then you can buy the whole machine for just 25 thousand Pakistani rupees. But they did not tell how long you can take this machine with you. On the other side, the experts of the Cornell University warned that the people, who like to get more and more likes on the social media can lose the purpose of their life, which can be dangerous for them but the wise and decent people give the priority to the comments and feedback. Moscow, The race of getting more and more likes and followers on the social media has made the young generation the psychic patients. They look for more and more likes and likes on their social media accounts. 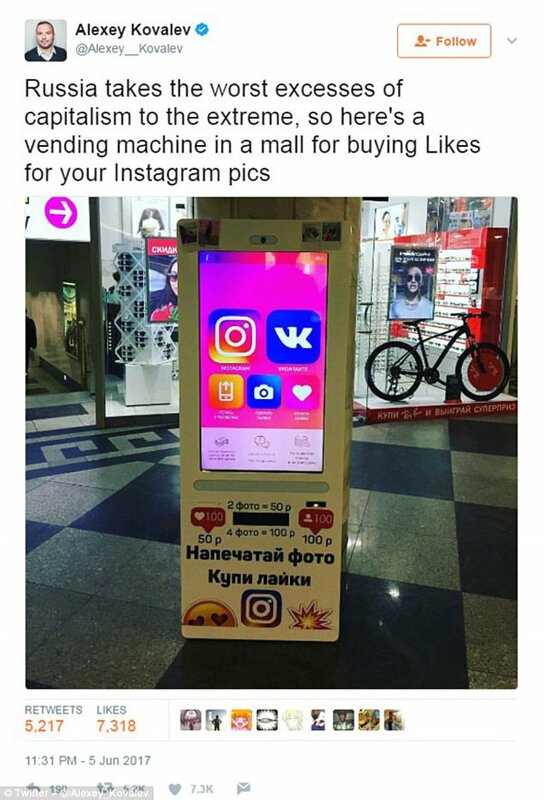 The young generation can get more and more likes and followers on the Instagram by paying some amount in the Russian shopping centers. 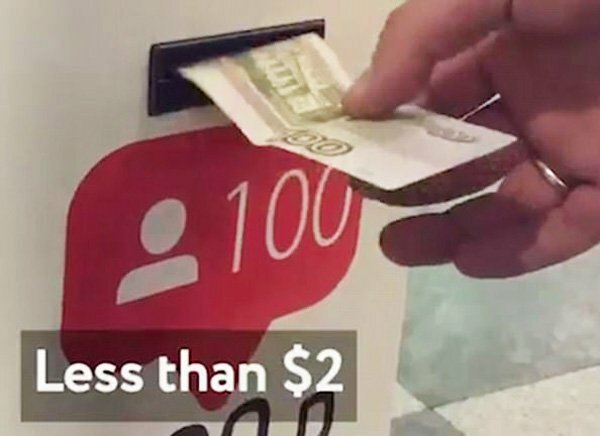 This machine is installed in the popular shopping centers in six big cities of Russia like Moscow, Saint Petersberg, Saratough, Owafa, Cheborusky and Peterozosk. This machine is called the Instagram likes and followers machine. If you insert 60 Robles (88 Pak rupees) in it then you can get 100 likes on your picture but they will be fake. If you pay 100 Robles (180 Pak rupees), then you can get 100 fake followers on the instagram. The Esnatap company has prepared this machine and this machine is called the Instagram like vending machine. A journalist in Russia protested on it and tweeted that the capitalism is on the peak with this machine in Russia. If you think that these likes are less, then you can buy the whole machine for just 25 thousand Pakistani rupees. But they did not tell how long you can take this machine with you. On the other side, the experts of the Cornell University warned that the people, who like to get more and more likes on the social media can lose the purpose of their life, which can be dangerous for them but the wise and decent people give the priority to the comments and feedback.